Dead would be the cheaper option and would cut out the greedy lawyers ! While society celebrates the assassination of supposedly the world’s greatest terrorist, I as a lawyer feel somewhat compromised. I have spent most of my adult life fighting for the rights of the individual against the Big Corporations, as have many of my colleagues. In doing so we have battled with Insurance Giants, Banks, Local Authorities and indeed the Government itself. We have done battle with these same entities who have one great advantage over us. That is, they are in control of the purse-strings and whenever it suits them, they can change the law to suit their cause. The idea of a level playing field is rather an aspiration these days. It has been a hard struggle but one where the clients interests are paramount. Not an easy battle to win when at times, your own Professional Body has ensured that you go into such battles with your hands tied firmly behind your back. While Insurance Companies, Banks, even Government Agencies use the media to their advantage, where we are being portrayed as the Anti-Christ Incarnate, out to damage Society to the detriment of the average Citizen. And thanks in great part to our Governors, we have no right to say otherwise. Over the last few months we see daily on our TV Screens that yet another Country is in Revolution. If you are on Twitter you’ll get the news much earlier before there is too much Spin (lies) attached. Some rebellions are peaceful while others are not. It seems that in the last few days we are told that Justice was served when Terrorist No.1 was assassinated by Country A in Country B’s back yard. No great shouts of breach of Sovereignty, International Law, Human rights violations, breach of X,Y & indeed Z, have been heard and so one is lead to the conclusion that indeed Justice must have been served. As lawyers we are faced with a dilemma. Do we speak up and state the obvious or do we take the view that the end justifies the means? Well, when I was at Law School the latter would certainly not be tolerated. Maybe times have changed. We are told there is a War on Terror and that we must all play our part. 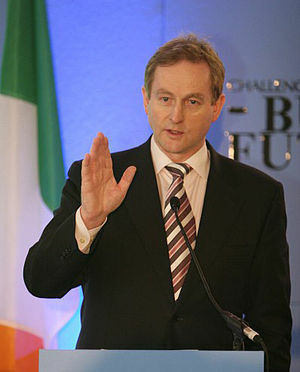 Our own Great Leader, Enda Kenny tells us we must Redouble our efforts in this War against Terror ! He should know as we have only recently elected him as our Leader. Well all those years in Law School must have been wasted. Maybe we all should have joined the Banks or the Insurance Companies or indeed trained with Politicians at home or on the advanced course at the EU. The change of mindset would have helped us decide on what is really Right and Wrong, as quite clearly our Law Schools got it badly wrong with over-concentrating our minds with such issues as human rights, workers rights and other such malarkey. The World is now in recession, so we’re told and we all need a bail-out. We must all take cuts and workers rights are being run over by steam rollers on a daily/hourly basis. But sure, that’s all right. The times we live in now dictate that only those in charge i.e. society’s elite should be shielded from such cuts. Banks have no money so the Citizen must pay up as it would be unthinkable not to save ‘Our Banks’. Did you ever consider for one moment, why at a time when we have little or no money that wars seem recession proof. Maybe there are Billions of Dollars/Euros out there to finance the War on Terror. Because that is what really matters. Some Banks must be funding this heroic effort and it would be unpatriotic for us not to continue doing our duty by contributing to such bailouts. We need to fund the War effort. While lawyers are usually at the forefront of Revolutions worldwide and risk their lives daily in pursuit of the rights of the Citizen, it seems that our lawyers must be more concerned with conveyancing for the privileged few or indeed dragging the Citizen through the Courts in order to take their home from them, for the Banks of course. Either that or ensuring the Citizen is incarcerated for non-payment of Litter charges or other such unpatriotic acts. Have I missed something here? What did Law School not teach me? I know that when I qualified I had to attend a lecture on Clients Funds and how to keep the Clients money in the Client Account. It was like an indoctrination in fact and one that was worth attending. On the other hand, I did attend an ‘optional’ lecture entitled ‘Ethics’. Excellent Lecture and well worth attending but why was it not mandatory? I suppose I should have been bright enough to have worked it out then but, as I said, we obviously weren’t taught the ‘right stuff’ at Law School. Listen, is it time to revert to the Wanted Dead or Alive Posters of the Old West? Maybe we could put a modern spin on it? Instead of Invading countries like Iraq and Afghanistan and spending Billions on a campaign to overthrow the Local Regime, maybe it would be better to just Nuke them. A once off payment which surely wouldn’t be too hard to negotiate with your local friendly Bank. There’s one Bank I know who market themselves as ‘the Bank who likes to say Yes’. Of course fewer people would be employed if this course was undertaken but at least it would wipe out unemployment in a couple of countries, at least ! I’m sure our Unions wouldn’t object to such measures. Haven’t really heard much from them lately. But I digress. We lawyers need now to go back to Law School again to learn the new laws as I’m certainly totally out of touch with the World as we now know it. I wonder how many Continuous Legal Education Points I’ll have to amass until I am ‘reprogrammed’ in the New Order of things. Maybe that’s what the IMF were referring to when they proclaimed the Reforming of the Legal Profession as a priority! And if the IMF/EU say it has to be done, our Government will have no option but to say ‘Yes’. Well that’s what they’ve told us so far, isn’t it? Or am I mistaken ? Ireland, indeed the World in 2011. Where are we heading? Or, should I say Who is being Targeted next? In fact, where the hell are we all heading and who is leading us there ?? Q I WAS recently employed to carry out some renovations on a customer’s house. The nature of the work necessitated that I went in and out of the house on several occasions. The occupants of the house had a storm door fitted and one of the children in the house closed it without my knowledge, the result being that I ran straight into it. I caused no damage to the door but my injuries amounted to a cut, severe bruising and a broken nose. Can I take an action against the occupants of the house ? A YOU do not state whether you were employed as (a) an independent contractor either by tender invitation to treat, (b) paid hourly or (c) paid weekly, monthly etc. or whether you are a friend of the family and not paid at all. Different rules apply. In the event of (a) applying you are responsible for your own safety precautions at whatever place of work you may be. If the child slapped the door in your face in the presence of one or both parents you could chance an action against the parents for damages for assault though I wouldn’t recommend such a course of action as it would be High Risk, though possible. A prudent renovator such as you seem not to be, in view of what occurred, normally carries his own insurance cover. Maybe you have a policy and could recover under this. Q OVER the Christmas period while driving home from work a drunk wandered out into the path of my car. The man bounced off the bonnet of my car and was taken to hospital, fortunately not badly hurt. What is worrying me now is must I report the incident to my Insurance Company? A YES, you must report the accident to your Insurance Company as provided in your Policy. If you do not do so you may find that your Insurance Company may try to avoid indemnifying you in the event of the injured party suing you. When the Insurance Company gets your notification of the accident they will furnish you with an Accident Report Form which you should complete and return to them. At this stage they are on notice of a possible claim and may well try to knock your No Claims Bonus. The drunk may take advice and decide to sue you. Most will not, but remember that you have a duty to look out for pedestrians while driving your car. This duty is particularly onerous when concerned with children. In any event tell your Insurance Company about the accident and leave the matter with them. Q LAST Saturday week a drunken driver ran into the rear of my car causing a lot of damage to both me and the car. My doctor has advised me that my injuries are primarily whiplash. Does the fact that I wasn’t wearing a seat belt alter my insurance claim in any way? A YOU are under a legal duty to wear your seat belt while driving a motor car. The same duty rests with the front seat passenger. It is a criminal offence to drive without your seat belt fastened and so you are liable to prosecution. This does not mean of course that in your particular circumstances the Gardai will deem it necessary to prosecute you. The Insurance Company against whom your action will lie i.e. who will be the Insurance Company indemnifying the drunken driver, will almost without exception treat your failure to wear your seat belt as a major contribution to the severity of your injuries. My view is that regardless of whether you wear wearing your seat belt or not, you would more than likely be suffering whiplash. Be prepared to have your damages reduced by a percentage.